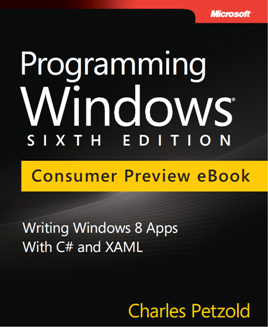 If you've already purchased the Programming Windows, Sixth Edition, Consumer Preview eBook, you should be getting an email in a couple weeks with a notification that you can download the Release Preview eBook. Later on this year — our target is November 15 — you'll receive another email about downloading the final eBook. There is no additional cost for these downloads. You're already paid up in full. You can get in on this deal by purchasing the Programming Windows, Sixth Edition, Consumer Preview eBook right now for $20. You'll be able to download the Consumer Preview eBook right away, the Release Preview eBook a couple weeks from now, and the final eBook later this year. If you prefer to wait a couple weeks until the Release Preview eBook becomes available, the same deal will cost $30, and the longer you wait, the more it will cost. Details can be found on the Microsoft Press blog. Chapter 8. "Animation": An extensive exploration of the Windows.UI.Xaml.Media.Animation namespace, including an interactive program that lets you explore the easing functions. Chapter 9. "Transforms": Both affine and non-affine transforms are covered, and sample programs include an analog clock and a demo flip-panel using projection transforms. Chapter 13. "Touch, Etc. ": An exploration of the Pointer and Manipulation events, including a finger-painting program, a piano keyboard (without sound, unfortunately), techniques for scaling and rotation with correct calculation of the transform center, and single-finger rotation. Chapter 14. "Bitmaps": Although unfinished, this chapter focuses on WriteableBitmap for making custom brushes (including a circular-gradient and radial-gradient) and manipulating existing bitmaps. Also covered is using BitmapDecoder and BitmapEncoder to load and save bitmap files. Chapter 15. "Printing": Hooking into the Devices charm for printing single-page and multi-page documents including dealing with pagination issues. Chapter 16. "Going Native": Although unfinished, this chapter covers the use of P/Invoke to access Win32 functions in a Metro style application, and the technique of accessing DirectX through a Windows Runtime Component coded in C++. Sample programs include a multi-timezone ClockRack, enumerating fonts and obtaining font metrics, and drawing on SurfaceImageSource using DirectX, which I used for a Windows 8 version of SpinPaint. Total page count for the Release Preview eBook is about 570. Consider how much your time is worth and how long it might take you to figure out one of these topics on your own (or by stitching together various blog entries), and the advantage of the coherent tutorial coverage you get in a book becomes very obvious. Special Price for the next couple weeks!